In Escalation as in the campaign, you'll be playing as the main Transformers, each of whom has their own abilities similar to those of the multiplayer classes. If you're playing as Starscream and your Megatron goes down, there's nothing that says you have to revive him, you know. The game isn't perfect: Sometimes I found myself confused in the heat of combat and attacking my allies instead of my enemies (thankfully, there was no friendly fire enabled), and it was difficult to find ammunition in multiplayer when I was low - though that may well just be my inexperience with the game and its maps. Cybertron may be a machine planet, but if the campaign just takes place in similar-looking gray corridors, it will get old very fast. But the license feels like it's in good hands with High Moon. The gameplay is tight, slick and intuitive, the classes are fun and varied, and long-time Transformers fans will probably appreciate the love that the developers have for the franchise: Where they couldn't take things directly from the old cartoons (like, say, the iconic transformation noise) they've come up with excellent replacements. In many ways, this feels like it could be to Transformers what Arkham Asylum was to Batman (even if it doesn't feel quite as brilliant as Arkham): Calling it "a good Transformers game" feels like doing it a disservice, because right now, Transformers: War for Cybertron is shaping up to be a very good game - period. Incidentally, High Moon team refused to confirm whether or not Stan Bush's 80s anthem "The Touch" would be in the game, but I was told that there would be a Stan Bush song. So, I guess it's either that or "Dare." 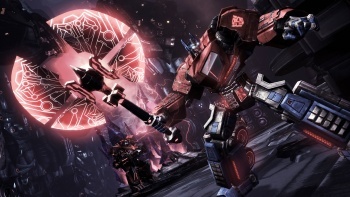 Transformers: War for Cybertron is out on PC, Xbox 360 and PS3 (with spinoffs for DS and Wii) on June 22nd.